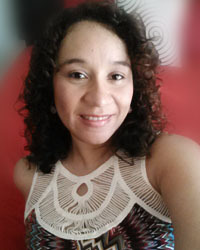 After working as an Administrative Assistant for over 10 years, and obtaining her Bachelor's Degree in Business Administration, she decided to take a break. During that break she got a job as independent sales representative selling photographic business cards. After the business owner not doing things right, she decided to partnership with another salesman and they created IDEAS Photoprints. Created her first business when she was in 6th. Grade; designing, making, and selling "jewelry" created with electrical cables. Her mind is always thinking about new business ideas and how make them work. Elba (AKA IDEASGirl) will help you setting up your website for whatever type of venture you want to start on the Internet. Workaholic, chocaholic, and window shopaholic... Elba Maria doesn't like to be called "graphic designer" because she never got a degree in design but she always was very passioned about creating and designing all her life. Also opening a business that she didn't know anything about and making over $200k in sales the first year of operations, should say something about her. She moved to Canada in 2003 and later on the business took another direction towards Web Development, that’s why the name changed on 2007 to IDEAS Creative Group. She lived there for 7 years and now she's back in Puerto Rico with many ideas to transform in businesses. Expertise:: A little bit of all except heavy programming. She loves working with Zen Cart ecommerce system.